When faced with competing demands and “impossible” schedules, missionaries may feel trapped into making very difficult choices. They may feel like they have to choose one thing over another, often forced to choose one good thing over another. On April 4, 1793, William Carey thought that was the choice he had to make as he took his 8-year-old son and boarded a ship to become a missionary to India. He was leaving his pregnant wife, Dorothy, and their other two sons. He did not want to leave his wife and break up his family, but he apparently believed he had to choose between marriage and ministry. When he could not reach India at that time, he returned home and was able to convince Dorothy to come with him, but his ministry was still more important than his marriage. Things did not go well with his marriage in India. After Dorothy’s death in 1808 William married Charlotte in 1809. By then he realized that he did not have to choose between ministry and marriage but that he had to blend ministry with marriage. 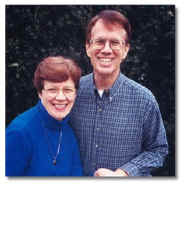 William and Charlotte were able to build a loving relationship in ministry. After her death in 1821 William said that his wife’s death was the greatest loss a man could live with. Today probably no church or agency would allow anyone to break up marriage and family to go the field. However, even today some people still believe that the choice has to be between marriage and ministry. If marriage and ministry schedules conflict, some choose ministry over marriage thinking that they must make an “either-or” decision. Aquila was a Jewish TCK growing up in Pontus near the Black Sea on the north side of what is now Turkey. People from Pontus were present at Pentecost (Acts 2:9). Aquila and Priscilla became Christian missionaries to several countries. Many missionaries have found that their marriage is a ministry. As one lady put it, “We realized that our students at various levels of theological training were reading our lives more intently than listening to what we taught.” What you do may speak so loud that nationals cannot hear what you say. Few people in ministry have students or parishioners come up to them years later and tell them how a particular lecture or sermon changed their lives. However, many have had people tell them how observing their actions, their lives, and their marriages had influenced them profoundly. Missionaries, more than most people, would understand what an ambassador is. Missionaries, like other believers, are Christ’s ambassadors through whom God makes his appeal to people of other cultures (2 Corinthians 5:20). When nationals come into missionary homes, they are entering the residence of God’s ambassadors. The way husbands and wives relate to each other and to their visitors affects God’s appeal to them. The Bible does not deal specifically with husbands and wives in ministry together as missionaries. However, it does deal with husbands and wives as leaders of churches planted by missionaries. Timothy grew up as a TCK in the town of Lystra in Lyconia. His mother was a Jewish believer and his father was a Greek (Acts 16). Timothy joined Paul during Paul’s second term of missionary service and traveled with Paul and Silas to many countries, including Greece, Macedonia, and Asia. One time when Paul, the senior mission administrator, was leaving for Macedonia, he asked Timothy to remain on-site in Ephesus to deal with problems in the national church there (1 Timothy 1:3). Later, probably from Rome, Paul wrote a letter to Timothy instructing him how to deal with several issues including the qualifications of church leaders (1 Timothy 3). Leadership in the church was not only the role of the one designated as leader, but also of the spouse. Though these instructions were for nationals in church leadership rather than for the missionaries themselves, certainly the missionaries overseeing them would have at least as much expected of them, probably more. Third, intentionally schedule both marriage and ministry times. Missionaries may come from time-oriented cultures where their agencies and supporters are more interested in “results” than in relationships. Such missionaries are likely to become more involved in doing things that show up in reportable statistics than in maintaining relationships with spouses, children, colleagues, and nationals. Without “relationship time” marriages suffer. Many years ago my wife and I were invited to a marriage enrichment weekend, but we found out that the leader was going through his second divorce at that time. Would you go? We know a couple who were both marriage counselors, but they had divorced and the husband married a client. Would you go to either of them for counsel about your marriage? What about nationals going to missionaries who are so busy conducting marriage retreats that they have no time for each other? Missionaries serving in countries where the macho male already sees himself as vastly superior to his wife must be very careful what they say. Macho men, and even their wives, may quickly pick up the phrase, “Wives, submit to your husbands…” and miss the previous verse which says, “Submit to one another…” (v. 21).